In colonial and early national Virginia, men of means constructed private residences to make political statements as well as to house their families. George Washington and Thomas Jefferson provided the most famous Virginia exemplars of this phenomenon in their Mount Vernon and Monticello, respectively. Jefferson’s architectural references to Republican Rome, his efforts to shield his family’s slaves from view, and inclusion of American Indian artifacts in the foyer were all self-conscious attempts to invent himself as an “American” statesman. The political statements were not always that nuanced, however. Like William Faulkner’s Col. Sutpen, many white planters built to show their mastery–over their land, fortunes, and slaves. When Dr. William Cabell moved west onto his James River patent in 1742, he constructed the “Swan Creek Plantation.” His youngest son, Nicholas Cabell, inherited the property upon his father’s death in 1774 and made several additions. 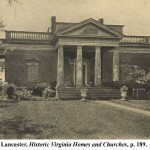 During the Revolution, as proof of his patriotism, Nicholas renamed the home “Liberty Hall.” Nicholas’ son also lived at Liberty Hall, before dying young and leaving the place to his son, Nathaniel Francis Cabell. N.F. Cabell made major modifications to the home and inhabited it for much of his life. Liberty Hall burned in 1895. 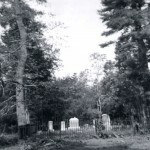 The Cabell Foundation owns and maintains the cemetery at Liberty Hall, where the founder, Elizabeth Burks, Nicholas, and Hannah Carrington, and several others rest. ADDITIONAL PHOTOS of Liberty Hall are available, courtesy of Archer Minardi of the Cabell Foundation. Though he inherited the property much earlier and probably lived in a series of more temporary homes, Col. William Cabell the elder began construction of “Union Hill” in 1775. 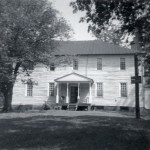 Like his brother, who rechristened the family homeplace during the Revolution, Col. William named his home for the patriot cause and the unity which he hoped the colonies would express. Union Hill became a center of Cabell activity, inhabited by Col. William Cabell, Jr., William H. Cabell, and Mayo Cabell. 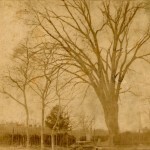 After Mayo’s death in 1869, Alexander Brown, author of Cabells and their Kin, purchased the place and gained access thereby to a trove of family records. 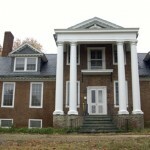 Union Hill, owned in the twentieth century by a succession of Cabells and a few interlopers, was moved from its original site in 1980, to a new Goochland County address. As at Liberty Hall, The Cabell Foundation still maintains guardianship of the Union Hill Graveyard. ADDITIONAL PHOTOS of the Union Hill cemetery are available, courtesy of Archer Minardi of the Cabell Foundation. ADDITIONAL PHOTOS of Soldier’s Joy are available, courtesy of Archer Minardi of the Cabell Foundation. 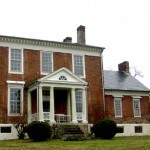 Robert Rives and Margaret Cabell married in 1790 and moved into a newly built home, “Edgewood.” In 1803, they left to build Oak Ridge and eventually sold Edgewood to another Cabell, Joseph Carrington. J. C . Cabell lived there until his death in 1856. 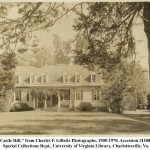 Cabells and Cabell descendants occupied the house through 1955, when it burned to the ground. A smaller house on the property, “Tucker Cottage,” remains in family hands. ADDITIONAL PHOTOS of Edgewood are available, courtesy of Archer Minardi of the Cabell Foundation. Nicholas Cabell, Jr. divided the lands of “Liberty Hall” among his heirs. One of the three parcels of land which he cut off was “Bon Aire,” given to son Dr. George Cabell. 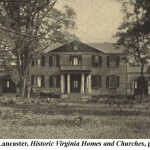 In approximately 1798, George built a manor house on the property. He sold the property out of the family at some time before his death in 1827. ADDITIONAL PHOTOS of Bon Aire are available, courtesy of Archer Minardi of the Cabell Foundation. 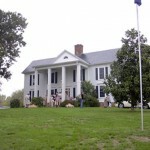 Robert and Margaret Cabell Rives left Edgewood (above) for Oak Ridge, which they built in 1801-1802. In 1901, a wealthy Nelson County native, Thomas Fortune Ryan purchased the property and transformed it into a sprawling fifty-room mansion. ADDITIONAL PHOTOS of Montezuma are available, courtesy of Archer Minardi of the Cabell Foundation. William D. Cabell‘s father, Mayo Cabell, built Norwood for his son following his 1853 graduation from the University of Virginia. Mayo Cabell had earlier added the Norwood lands by purchase to the Union Hill parcel. ADDITIONAL PHOTOS of Norwood are available, courtesy of Archer Minardi of the Cabell Foundation. 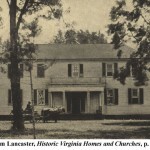 Doctor Thomas Walker (1715-1794) built Castle Hill in Albemarle County in 1764. Walker’s granddaughter, Judith Page Walker, married William Cabell Rives, thereby bringing the home into the Cabell circle. The property became especially famous when Rives granddaughter Amelie Rives (1863-1945) married Prince Pierre Troubetzkoy of Russia and became Russian royalty while inhabiting the estate. John Cabell Breckinridge acquired 30,000 acres of land outside of Lexington, Kentucky in 1793. 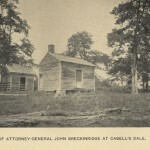 Among the first buildings that he erected in the tract, known as “Cabell’s Dale,” were these law offices. 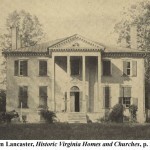 Mary Cabell Horsley’s great-grandson, William Andrew Horsley (1815-1887) lived at Rock Hill, a home built in 1825 one mile from Wingina. After Horsley’s death, the home fell into disrepair and its 637 acres were divided into many parts. 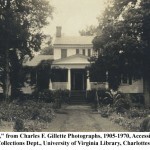 Dr. W. Horsley Gantt (W. A. Horsley’s grandson) and his son reassembled the original plot, and then some, and restored the home to its outstanding condition. ADDITIONAL PHOTOS of Rock Cliff are available, courtesy of Archer Minardi of the Cabell Foundation. John Hartwell Cocke, father-in-law of Nathaniel Francis Cabell, built and rebuilt three elegant homes along the James beginning in about 1803: Upper Bremo, Lower Bremo, and Bremo Recess. Cocke lived in Upper Bremo (at left) until 1855, when he traded homes with his son, Dr. Charles H. Cocke, and moved into Lower Bremo. 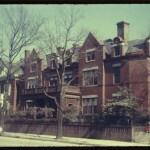 One of the few urban Cabell residences of note, at left is James Branch Cabell‘s Richmond residence. *Copies of Mrs. Minardi’s prints were received electronically; hard copies are not available at the University of Virginia Special Collections Library.